Trades role: Gemma Hartwig is facing up to challenges as a diesel fitter. 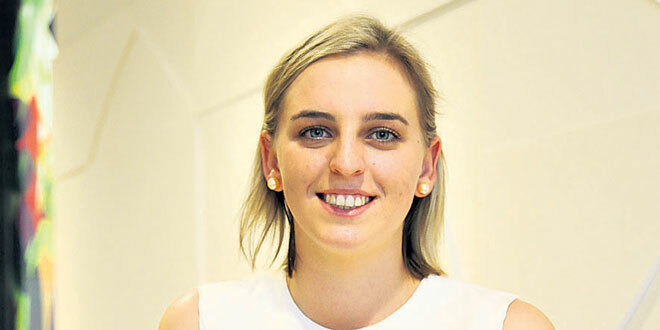 Gemma Hartwig knows all too well the challenges of being a young woman working in a trade. An 18-year-old diesel fitter, who attended Our Lady of the Southern Cross College, Dalby, is grateful for the opportunity to follow a Vocational Education Training pathway, which led to a trade apprenticeship. However, she told a VET Symposium 2016, organised by Queensland Catholic Education Commission, it had taken “all her strength” to overcome uncomfortable challenges in the workplace. “Never give up,” she told VET teachers, advisors and administrators from across the state. “Being the only woman is very isolating. “Having support from teachers, colleagues and family is important. Ms Hartwig grew up on a dairy farm near Dalby, but when her family sold up, she moved into town. When she was 14 she did a one-week work experience with a tradesperson and, based on her aptitudes and preferences, a school career counsellor suggested she might thrive doing a school-based trades apprenticeship. “The way I think, the way that I learn – it really suited me. And it’s been in my family for years and years on both sides,” she said. At school, Ms Hartwig worked in a trade one week each month while completing Years 11 and 12. In her final year, she was a college captain. She finished her diesel mechanic apprenticeship after school and joined a local firm, but she admitted her workplace experience had been “disappointing”. “I have to prove myself every day because of my gender. And that is a really sad thing,” she said. “We live in Australia and it’s 2016. Women should get the same opportunities as men. The downswing in the mining industry has also meant there have been job cuts in her field of engineering. Ms Hartwig still has a job, but even this, she says, had caused workplace friction. “I really appreciate still having a job, but others have used it against me, saying I’m only still there because I am a girl, and I got told I’m the ‘promo’ girl,” she said. “Hearing that stuff is hard, but I want to be the best tradesperson I can be, so you’ve got to put that behind you. Ms Hartwig said that she called on her faith for strength. Ms Hartwig said she would like to use her experiences to improve pathways for tradeswomen. “I feel it really important to have support for girls in this industry so I would like to be part of something – like having my own website that girls can blog on, share experiences and ask for support,” she said.